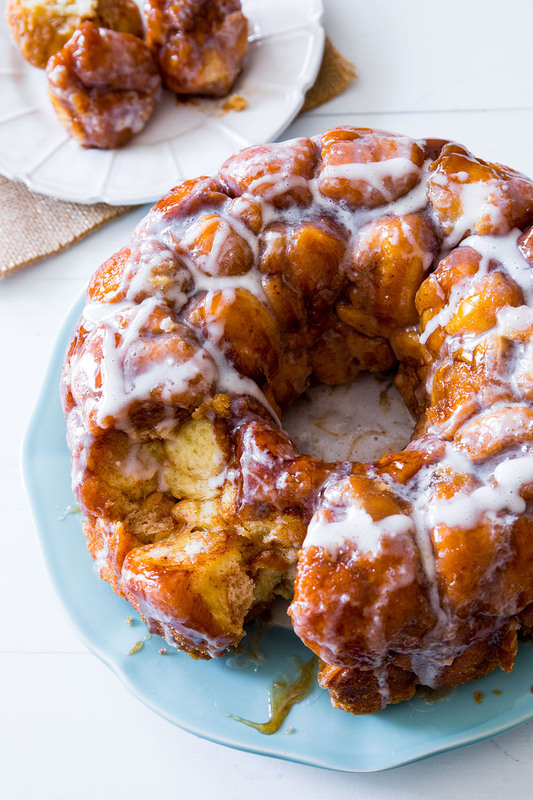 Classic monkey bread is sweet pull apart bread baked in a bundt pan. This homemade version is heavy on the cinnamon-sugar and sweet vanilla glaze. Make the dough: In a large mixing bowl, dissolve yeast in warm water. Stir it around a bit and let it sit for about 2 minutes. Add the milk (2% or higher milk fat is recommended), melted butter, sugar, eggs, salt, and 3 cups of flour. Beat on high speed for 3 minutes (using a dough hook if you have a stand mixer or using a hand mixer). By hand add enough remaining flour to form a firm dough. About 5 cups total. Turn the dough onto a floured surface. Knead until smooth and elastic, about 5 minutes. Do not over-knead, which will yield a tough, chewy bread. The dough is ready when it is smooth and when you can poke it with a finger and it springs back. Form dough into a smooth ball and place into a large greased bowl (use cooking spray or oil), turning once to grease the top. Cover tightly with plastic wrap or aluminum foil and refrigerate for 8 hours or overnight. Spray a 10-12 cup bundt pan with cooking spray. Set aside. Punch the cold dough down very gently to allow the air bubbles to release. Pull apart pieces and roll into balls, about 1.25 inches in diameter. You will need 40-45 balls total, so be modest with their size. Dip each ball, one by one, in the melted butter and then generously roll in the cinnamon-sugar mixture to coat them. You may need more cinnamon-sugar depending how heavy you coat each ball. Arrange them in the bundt pan as you go. If you did not use Red Star Platinum yeast, cover the pan and allow dough balls to rise again for about 45 minutes at room temperature. If you did use Red Star Platinum yeast, move ahead to the next step and bake right away. Preheat oven to 350°F. Melt the remaining ¼ cup of butter and whisk in the brown sugar and vanilla until combined. Pour the buttery mixture over the dough balls in the bundt pan. Bake for 30-35 minutes or until golden brown on top. Cover loosely with foil if the top browns too quickly. Cool for 5-10 minutes and invert onto a large serving plate. Easy to follow recipe and it turned out beautiful and delicious. Made this recipe with my 11 year old granddaughter, she loved the kneading process. There is a little too much dough for the bundt cake pan. It over flowed, good thing I had a pan underneath. Some of the dough fell out of the pan. Next time I will put it in a 9 x 13″ pan.